Ever wonder what happens to a marathoner's body during those 26.2 miles of pavement pounding? It ain't pretty. 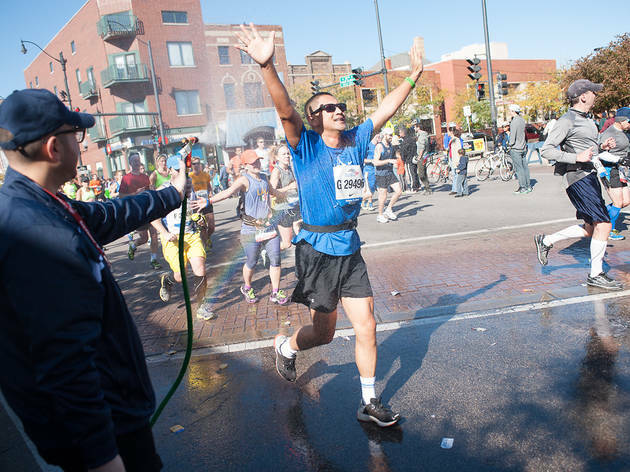 Photograph: Mark Wright A spirited crowd cheers on runners in Pilsen during the Chicago Marathon on October 13, 2013. “You’re cruising,” says Jonathan Dugas, Ph.D., an exercise physiologist at the University of Illinois and author of the blog SportsScientists.com. “You’re running through the Loop and are swept up by the crowd and the spectators.” After a week of tapering and nervous energy, it’s not uncommon for runners to look at their stopwatches and find they’ve completed the first mile 45 seconds faster than their training pace. During the run, your heart rate will drift up even if you’re jogging at a steady, comfortable clip. “It’s nothing to be worried about,” Dugas says, noting that the key is running at a pace you’ve trained for so you don’t fizzle early. A couple of hours of heavy breathing and perspiration means you’re going to lose fluid—it varies depending on how much you sweat and what the temperature is. An average runner can expect to lose a couple of pounds by the end of the race. Many will see a layer of salt forming on their skin. Marathoners know better than to experiment with new foods in the days leading up to the event (so no bacon-flavored cupcakes on race morning!). But what runners eat and drink during the race is just as important, says Dugas. Snacks like bananas, energy gels and Gatorade will be available at various aid stations. But for some sensitive-stomached folks, even the seemingly minor decision to practice with different sources of fuel on training runs can lead to a world of unpleasantness on race day. With every step runners take, they load their legs with a force heavier than their body weight (because of momentum as the body jostles up and down). The result: tiny tears in the muscles that—no surprise after thousands of steps—give the quads something to whine about for the rest of the race. “As the duration of exercise increases, the body depletes its stored muscle glycogen,” Dugas says. “It will look to the blood for glycogen now, which is why it feels like you’re running on empty.” Unfortunately, your brain knows what’s up: As it senses the liver is running low on the body’s preferred source of energy, you might feel light-headed. It doesn’t have to be that way, though: Runners can stave off the dreaded wall by periodically eating carbs (via energy gels and sports drinks, available on the course) during the race. “At this point, a runner’s perception of effort is quite high,” Dugas says. “Time seems to slow down.” You might find yourself trying to calculate how many more minutes of running are left—and feeling like a frustrated third grader just learning how to multiply. Fuzziness? Spaciness? Both are present and accounted for. “Your legs are getting very, very dead,” Dugas says. “You probably feel like you’re running in sand.” Unlike the bouncy, efficient strides runners displayed in the early miles, now the gaits are wobbly. No matter how much you trained, you’ve put your body through the ringer and that takes a toll. “You’ve sustained a reasonable amount of muscle damage and you’re spent,” Dugas says. “Most people are going to be feeling like crap.” But seriously, at this point, who cares? You made it!